I can’t be the only one to confess that my blood pressure raises and eyes dilate when I hear the all too familiar “Ding!” of my phone when a new email comes in. I’m like one of Ivan Pavlov’s dogs, except instead of salivating, I’m overcome with the urge to immediately check my phone and respond instantly with an answer to or acknowledgement of the pending request. This mindset can make for a stressful week, but apply it to the 2-days we’re supposed to allow ourselves for rest and relaxation each weekend and this flirts on the brink of insanity. As a new business owner, I’m told – this too shall pass. But what if it doesn’t? What if fate should have it that my obsession with instantaneous answers isn’t linked to my young entrepreneurship, but rather the growing trend in technology? Now we’re no longer flirting on the brink of insanity, we’re outright courting it with a fancy dinner and bottle of wine. I can’t help but fantasize with the idea of living in a 1950’s office environment just for contrast. What was it possibly like to lock the door on your business at 5pm Friday and be unreachable until 9am Monday? Moreover, what was it like to wait around for a written memo to be passed from office to office until an answer was returned hours…or days later? The TV show Mad Men might give us a glimpse into this lifestyle, but we will never truly know what it is like to live it. What some might see as a business-stifling, slow communication process, I see as the key to a work-life balance. With the aid of ever-connecting technology, we have officially become accessible at all hours of the day and so we have trained ourselves, and our peers, to expect immediate responses regardless of weekends, holidays and once in a lifetime occasions like weddings, funerals and even the birth of our own children. I acknowledge that I’m somewhat at fault for this. I check emails on my phone with the same repetition in which I breathe or blink. And answering emails on the weekend only encourages conversation because I voluntarily make myself accessible. So this weekend it stops. I want that 2-day break; I earned that 2-day break – and so did you. So why do we continue to choose to watch our phones rather than watch a movie with our significant other? Why do we use our weekends to pitch to a potential client when we could be pitching to our son or nephew on a beautiful sunny day? Let’s call a truce. Let’s work hard this week so we can designate this weekend for rest and relaxation. But I can’t do it alone. I challenge each of you to limit your emails this weekend to urgent communication only. Ask yourself, “Can it wait until Monday?” And then get out there and enjoy an entire Saturday and Sunday to yourself. Lock your email, just as you would your office door, at 5pm on Friday and open it again Monday at 9am. 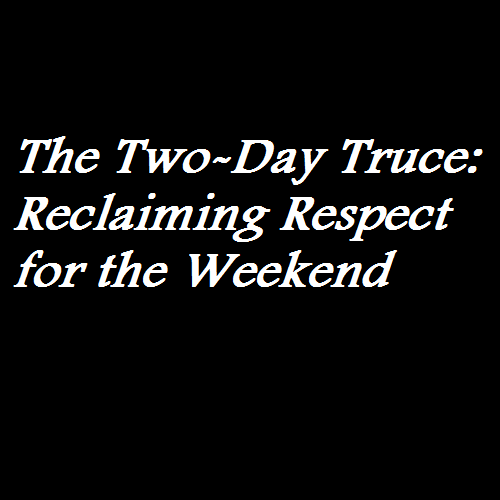 I promise you that calling a Two Day Truce, won’t result in the demise of your business, but more likely will result in allowing others to also reclaim the respect for their own weekend.